Spiky origami model of brown color. Astronomical body made from paper. Beautiful geometry of modular paper art. Astronomical stellated paper figure. Celestial body origami. Japanese art Kusudama. Spiky origami model on green screen. Brown cosmic satellite made from paper. Japanese paper folding art. 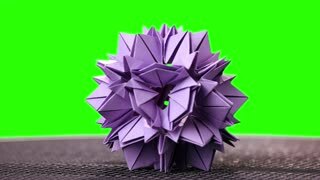 Violet origami flower on green screen. Spiky origami model on chroma key background. Trendy kusudama art. 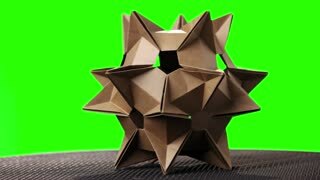 Spiky origami model on green screen. Origami star figurine on board. Modern kusudama art. Two paper colorful foxes. Origami animal models made of pink colored paper. School paper art exhibition. Spiky origami model of yellow color. Yellow star origami figurine isolated on white background. Japanese paper craft. Modular origami figure on white background. Yellow origami ball. Paper folding and geometry. Stellated spiky origami figure. Cosmic ship made from paper. Creative paper geometry decoration. Beauty of japanese art.